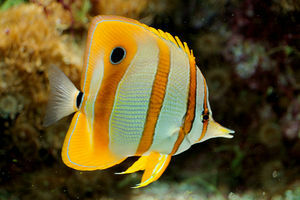 Please copy and paste ' [[Category:Butterflyfish]] ' into the end of your article to include it in this category. Butterflyfish are saltwater fish belonging to the family Chaetodontidae. There are approximately 127 species in 11 genera, mostly found on the reefs of the Atlantic, Indian and Pacific Oceans. Many species in this family feed primarily or exclusively on live corals, making it very difficult to maintain them in an aquarium. The species with less specialized feeding behaviour are generally easier to maintain. Butterflyfish are pelagic spawners; that is, they release many buoyant eggs into the water which become part of the plankton, floating with the currents until hatching. The fry go through what is known as a tholichthys stage, wherein the body of the post-larval fish is covered in large bony plates extending from the head. They lose their bony plates as they mature. Only one other family of fish, the Scats (Scatophagidae) express such an armoured stage. This page was last edited on 16 October 2015, at 12:43.